Searching in Windows Vista has taken a great change, improvement and enhancement in Windows Vista, and integrated into Windows Vista new and improved file and data management that Microsoft called Windows Vista’s new information visualization, organization, and search features. With these new features, Microsoft hopes that it will be easier and faster for users to access and find files and documents that grow larger and bigger everyday. Same with Windows XP, Windows Vista also uses an Indexing Service that designed to scans through the files in advance in order to return search results with faster response. But unlike Win XP, the Vista Indexing Service is more efficient as it doesn’t index the entire hard disk, but only specific locations that most likely will contain your files. 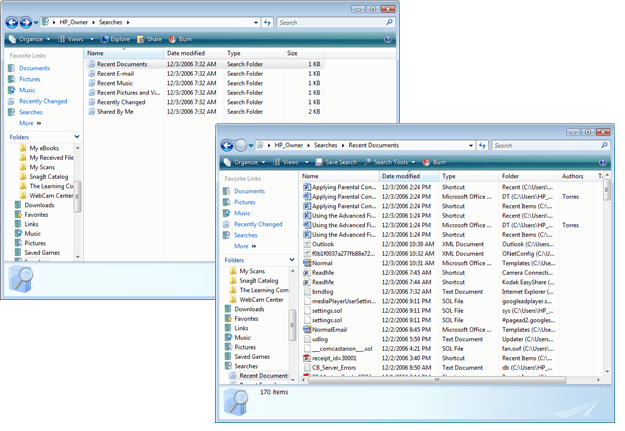 Indexing and Search Options in Windows Vista, accessible via Control Panel and double-click on the Indexing and Search Options icon. In order to search for files, folders, documents, workbooks, videos, songs, applications, installed programs or any other stuffs in Windows Vista, simply click on Start button. You will see a search box of Start Search feature just above the Start button. Simply start typing in the name of the file that you want to find or search. 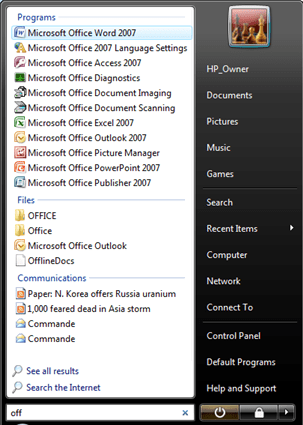 As soon as you type in the first character, Vista search engine immediately returns a list of programs, files and communications in a categorized list that match the pattern of the search terms on the left pane of the Start menu, which automatically and instantly converts into the search results pane. As more search text is entered, Vista will refine its search results on the fly. Beside, on the bottom of the search results pane, Vista will also display links that are the most likely candidate for the file or folder that you’re looking for. When you click on any of them, or press Enter, Windows Vista will load and open the file or folder. You will also see Search the Internet or Search all results options at the bottom. When click on Search the Internet, Windows Vista will launch Internet Explorer and search for the keywords using Windows Live Search or MSN Search, then display the search results in IE. Search all results will launch the full feature search window that display all possible matching search results as mentioned below. Other than searching directly on Start menu, there is any shortcut to full feature advanced search tool in Start menu. The advanced search window allows user to specific additional search criteria and filters to narrow down and limit the search results. The search tool also supports usage of Boolean operators of AND and OR. In these options of start searching are not enough, it’s also possible to perform instantaneous search from Documents folder window. Open Documents, then open Favorite Links and then click on Search. You will be presented with a list of preset search criteria or conditions such as Recent Documents, Recent Emails, Recent Music, Recent Pictures and Video, Recently Changed and etc. When you click on any of them, the search results are displayed immediately on the window itself. You should also notice that now on top right corner of all Windows displaying any folder, there is a little search box. This search box can be used at any time to search for files, folders, programs or any other stuffs in your computer. 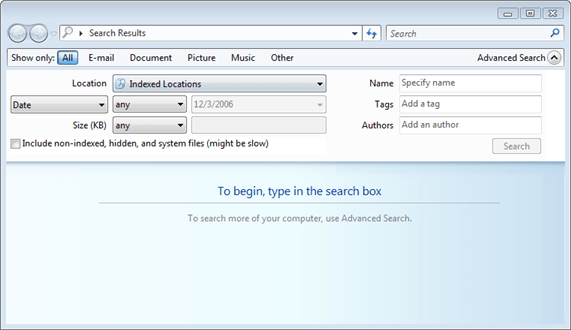 The best part of the search features in Windows Vista is that it’s possible to click on Save Search and save the search criteria, filters and conditions as a frequently used search link pre-saved and accessible from Favorites Links.